With all the options of large format equipment available today, it is easy to get caught up in the best, the fastest, the most expensive. It is worthwhile stepping back sometimes and trying the minimum. This is one example, an old Pony Premo No.3 plate camera modified to use modern sheet film and a Taylor, Taylor & Hobson Cooke Anastigmat F6.3 162 mm that came off a Kodak 3A folder. This is nothing fancy, just the bare bones. As portraiture and some types of landscapes do not require a lot of camera movements, a good piece of glass will do well, even if it comes from humble beginnings. The major modification that needs to be done on this camera is to adjust the ground glass so that it is the same distance from the lens as the film would be in a sheet film holder. The ANSI standard depth for 4x5 sheet film holders is 0.197" plus or minus 0.007". The quick and dirty solution is to flip the ground glass in the back of a plate camera, so that the matte side is on the outside. This usually works, but the focussing must be checked with a focus test. I ended up adding a 1 mm (0.04") shim to bring mine up to the right distance, because my ground glass was a little thinner than most. That's it. All those wonderful plate cameras that have been languishing on the shelf or in closets can now come out! Gordon Hutchings, the creator of PMK developer, used a Pony Premo as a light field camera, in the sixties. He found his at a flea market for a couple of dollars. The original lens and shutter were not working, so he replaced them with a 6" f6.3 Tessar in a Kodak Ball Bearing shutter and used it as his backpacking field camera. They are ideal. Now, there are some restrictions using such a simple view camera. My Pony has a single extension focussing rail, with no geared adjustment. So, it is limited to a normal lens, but it will focus down to 4 feet. I was initially concerned that it didnít have geared focussing, but it works well. It has about an inch of front rise and the back allows for seven degrees forward and five degrees backward tilt. Mine is a newer model than Gordonís. He added the back movements to his with a little brass and a couple of battery clamps. My choice of lens for this camera might seem odd, considering all the available choices. Well, there are a lot of really good vintage lenses, but I chose this one for a reason. I like the images I get with this triplet. Dennis Taylor designed the Cooke Triplet in 1893. Taylor, Taylor and Hobson (no relation to Dennis Taylor) manufactured the lens and named it the Cooke Triplet, out of respect for Dennis' employer Cooke of York. Since the early 1900's just about every lens maker has produced them, but not all triplets are equal. There are some that are better paperweights than lenses, but I have been pleased with the results obtained with Cooke Anastigmats and Zeiss Novars. Not that I donít like more corrected lenses, but there is more to an image than just high resolution and the lowest amount of aberrations mathematically possible. How a lens deals with tonality, the character of it's sharpness and ëbokehí* are my criteria. This portrait detail illustrates the image quality of the Cooke triplet lens on the Pony Premo. It is a little soft because I exposed it at f/8 - nearly wide open on the f/6.8 lens. I was limited by the light and did not want to shoot slower than 1/2 second. A very simple but effective focussing test can be done using playing cards, held up by clothes pins on a table. Stagger the cards 6 inches apart, at an angle from the cameraís point of view. Set the camera 6 feet from the middle card. Shoot wide open, for the minimum depth of field. The three cards in front and three cards behind are enough to tell you how accurate your focussing is. If the centre card is not the sharpest, then you adjust the ground glass offset. This test gave me a very interesting result with the original lens that came with my Pony. 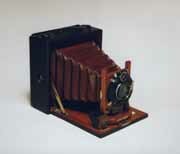 It was a Bausch and Lomb Rapid Rectilinear in a pneumatic Victor shutter. Very pretty and it worked well for a while. Unfortunately, the shutter became erratic and didn't give consistent speeds. Well, as it is a hundred years old. I understood that it had just got tired. However, it was the lens that was the mystery. When I developed the test negative, it seemed, at first, that it was focussing properly. The centre card was in focus, but so was the left hand corner of the table, nearest the camera! I would have to arrange my photos so that anybody on the left hand side would have to stand real close. The lens elements do not look misshapen and the lenses are square in their mounts. All I can figure is that the glass is not homogeneous and that one side of one of the elements has higher refractive indices than the other. In other words, they didnít stir the mix well enough when they made the glass! It's a very nice paper weight now. I want to add a cautionary note about Compound shutters. They are not the "dunk in solvent, if it's slow," kind of shutter. Donít do it. The aperture blades are made of paper. They do not take kindly to getting wet and they don't work well after that! If your Compound is slow and doesnít respond to firing the shutter a dozen times on every speed, then have it cleaned and lubricated by a qualified camera tech. Exercise mechanical shutters every six months. Regular use keeps these shutters happy. So, get that olí plate camera out of the closet and try taking some pictures with a bare bones vintage camera. *Bokeh is a Japanese word for the image that the lens produces outside of the plane of sharp focus. Different lens types produce different kinds of bokeh; some smooth and some very harsh and distracting. It is unnoticed by most because they only pay attention to what is in focus in the picture. It is a subtle, but important factor in our aesthetic response to an image. Paul Lewis is a photographer, photochemist and metalsmith living in Canada, who enjoys the pleasures of classic cameras and infrared photography.